There’s really no need for me to recount the wonderful dinner I had at Church & State last week. 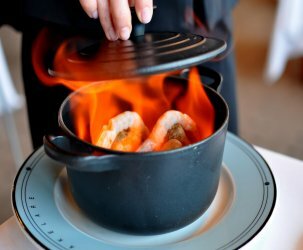 By now, every blogger, critic, and casual eater knows that the downtown bistro is a gem. And more importantly, the man who made the restaurant what it is today has one foot out the door. Like I said, there’s really no reason for me to write about this place again, except that I totally can’t help myself—Church & State is so incredibly good! I sat down to a most satisfactory feast with The Astronomer, my mom, and D takes a B on the evening following Chef Walter Manzke’s announcement that he would be leaving the restaurant. We arrived right as the doors opened for dinner service. I usually don’t sup until the sun has fully set, but we had tickets to The Lake Show this evening, so it was imperative not to miss the opening tip-off (and the celebrity sightings). 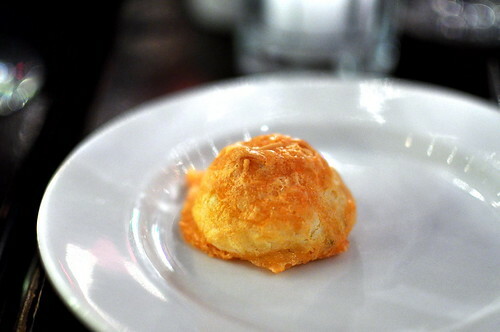 To start, complimentary gougères for the entire table. The cheesy poofs were warm, light, and delectable. Next, crusty baguettes, soft butter, and coarse sea salt arrived at the table. The simple spread was so satisfying that we inhaled it in mere minutes. 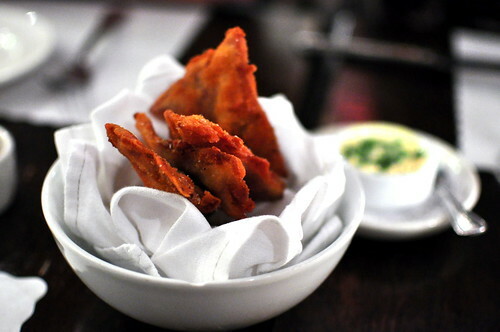 Our first starter was the Oreilles de Cochon—crispy pig’s ears with a Bearnaise sauce ($8). Unlike the chewy specimens I’ve sampled in the past, Chef Manzke’s ears were vein-less, gelatinous, and had a velvety finish. The thin batter coating the ears provided a crisp and salty complement to the unmistakable essence of ear. The Escargots de Bourgogne, snails baked in garlic and parsley butter ($13), was as good as ever. 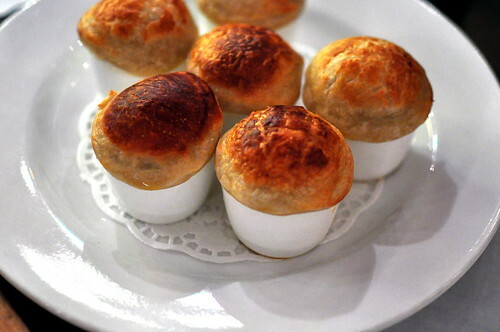 After a lot of trial and error, I’ve come to the conclusion that the best way to consume these little vessels is to gingerly peel the puff pastry from the ramekin, dunk it with abandon into the hot and garlicky butter, then scoop the snail and butter-soaked pastry onto the spoon and into one’s mouth. It’s a lot of mass, but the flavors cannot be beat. 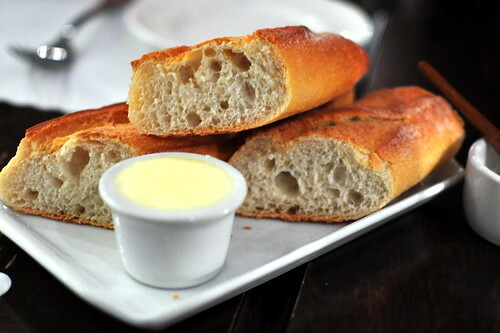 Be sure to swipe the house baguette through the ramekin afterwards so as not to waste a drop of butter. My favorite course of the evening was the Assiette de Charcuterie—a selection of artisan and housemade pâtés, terrines, and saucisson sec ($18). The nearly three-foot long plank was beautiful to behold and crazy-delicious to consume. The pork rillettes with prune confiture were rustic and delightful, as were the various duck, pork, and rabbit pates. 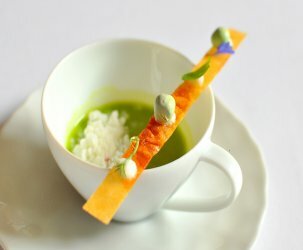 The most memorable was the goose liver pate with chives and coarse salt. I drifted off to a very special place with each bite. Balancing out the richness were briny olives, cornichons, pickled vegetables, dijon mustard, and little radishes swiped with butter. Heaven on a plank. After indulging in three appetizers and countless loaves of bread, we shared two entrees. 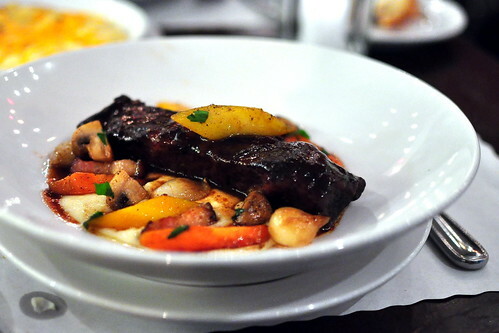 The Astronomer picked the short ribs ($26), which were served with roasted carrots, mushrooms, pearl onions, and a heap of pureed potatoes. The meat was so tender that a plunge of the fork was all that was needed to tear off a hunk. 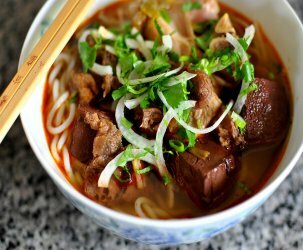 This is comfort food at its best. 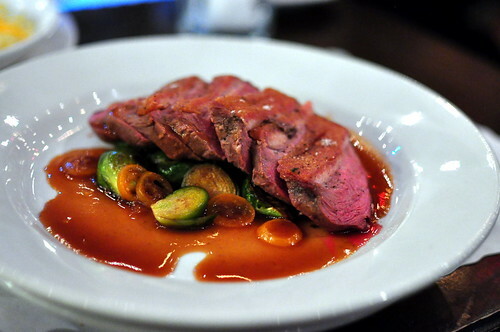 The seared duck breast with Brussels sprouts and candied kumquats ($24) was also expertly prepared. I loved how well the tart little fruits mingled with the duck’s natural juices. With Church & State’s kitchen in flux, I was pleased to take in one final meal with Chef Manzke running the show. It’s uncertain what the future will hold for both the Chef and the restaurant. 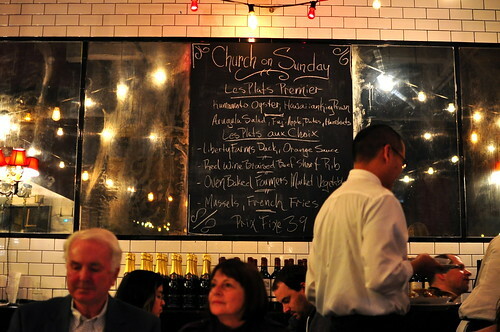 However, one thing is for sure—with Chef Manzke manning the stoves, Church & State is nothing short of spectacular. Sad I never made it back before Manzke leaving, but I’m hoping C&S will remain delicious with the new chef. I’m definitely gonna try Manzke’s new venture when it opens. 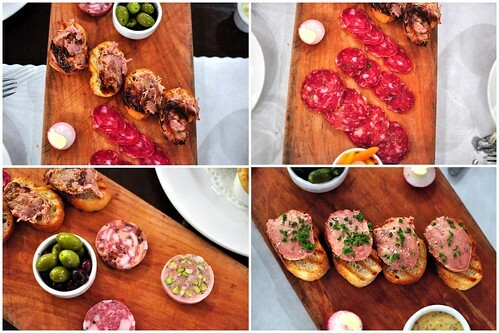 Hah – you really are the person in my post that would find the charcuterie to be Heaven on a plate! It seems like the restaurant lighting was dim, how did you manage to take such great shots? What camera/setting/photoediting program do you use, if I may ask? i need to give this place a go. I keep hearing all about it and every time I see the delicious food, it makes me want to go even more. Mai – I shoot with a Nikon D90 with a 35 mm f1.8 lens. I shoot on program mode and always utilize the white balance function. All of my photos are edited in Picasa. I hope to have a post up on the ins and outs of my camera and photo editing soon. Although snails are Greek Orthodox lenten approved (since they don’t bleed), I couldn’t bare to eat them without a buttery sauce and encased in a rich pastry. Kudos to you for getting D to take a B out of the pig’s ear. Omgosh I am living vicariously through these pictures, sounds like an utterly amazing meal!!! I was there last Thursday! I had never been and knew I had to check it out before Chef Manzke moved on. The sea urchin toast was pure bliss and even the brussels sprouts that came with the duck were something special. Best meal I’ve had in a long time. Wow…you’re pictures are so lovely and appetizing and, and, mmmm! Wow. Your pictures are SO lovely and beautifully shot and, and, and…mmmm…. Has this place been awarded any Michelin stars yet? 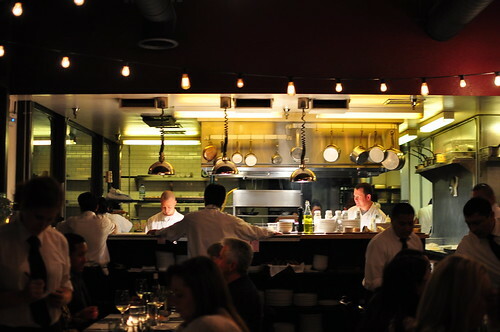 CP – Michelin is no longer dolling out stars in LA. Ah, so lovely – thanks for posting these wonderful photos and describing these delicious creations. The duck with brussels sprouts and kumquats!! Mouth watering!